eCrimeEU 2019 will look into the challenges facing cybersecurity, the continuous and predictable cyberthreats, and incident responses at all scales. With eCrimeEU 2019 we will review the development of response paradigms and resources for counter-cybercrime managers and forensic professionals in the private and public sectors – always with an eye to point out opportunities build bridges of cooperation between them. Presenters will review case studies of national and regional economies under attack and examples of successful trans-national forensic cooperation, while considering models for cooperation against eCrime and examining resources for cybercrime response and forensic enterprises. This program will be held on October 1st- 3d in Barcelona, Spain. 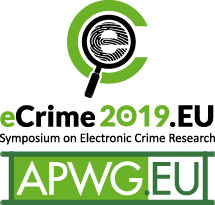 Venue information for the EU Symposium on Electronic Crime Research 2019 is available HERE. Case studies of current attack methods, including phishing, malware, rogue antivirus, pharming, crimeware, botnets, and emerging techniques. Technical, legal, political, social and psychological aspects of fraud and fraud prevention. Malware, botnets, ecriminal/phishing gangs and collaboration, or money laundering. Techniques to assess the risks and yields of attacks and the success rates of countermeasures. Delivery techniques, including spam, voice mail and rank manipulation; and countermeasures. Techniques to avoid detection, tracking and takedown; and ways to block such techniques. Design and evaluation of user interfaces in the context of fraud and network security. Submissions should include author names, affiliations and acknowledgments (if any). They should not exceed 2 letter-sized pages and should be written at an introductory and technical level. Each should begin with a title, abstract, and may optionally include introduction or session slides.